Blue Origin's New Shepard suborbital rocket and space capsule during a test flight. ATLANTA — Earlier this month, at the Dragon Con science-fiction and fantasy convention, a representative from the private spaceflight company Blue Origin spoke to a crowd about the company's progress on its two launch vehicles: New Shepard and New Glenn. "Our vision is to get billions of people living and working in space," A.C. Charania, Blue Origin's manager of advanced programs, said during his talk. "It's a very exciting time in the space industry." Blue Origin's New Shepard vehicle is named after NASA astronaut Alan Shepard, the first American to go to space. Shepard's pioneer flight , which kicked off human access to space, helped inspire New Shepard's creation, Charania said. With a crew capsule on top of the rocket, New Shepard is capable of taking six people to an altitude of 62 miles (100 kilometers) for less than an hour. "Each seat has access to a very, very large window," Charania said. "It's going to be a very cool and interesting ride into space in this vehicle." The first crewed test flights are planned for 2018, but so far, New Shepard has carried only scientific payloads into microgravity. "There's a very high [scientific] interest in getting microgravity time that's very accessible and very affordable," Charania said. Currently, researchers who are interested in microgravity experiments have limited options. They can put their experiment on a sounding rocket (which can carry small payloads but not humans), or set up on the International Space Station (ISS), which requires working with NASA or CASIS, the agency that manages the laboratory on the station. Or, they can lift off on the so-called "Vomit Comet," a plane that flies in a wave pattern of steep climbs and sharp dives. While the ISS can give weeks or months of steady research time, the Vomit Comet provides it in bursts of only a few seconds (and can be a bit nauseating to travel aboard if the researcher tags along). Alternatively, an Earth-based option involves drop tubes, in which free-falling test vehicles can briefly simulate low gravity. "Now, with New Shepard, you have an additional option where you can put your payload inside the capsule and get several minutes of microgravity time," Charania said. Unlike rockets built by NASA in the past, the New Shepard vehicle reuses both its crew capsule and its booster. The crew capsule returns from space on a parachute, while the booster makes a vertical landing. Blue Origin is also developing the New Glenn orbital vehicle, which is named for NASA astronaut John Glenn, the first American to orbit the Earth. Whereas New Shepard is a suborbital vehicle, New Glenn is designed to take payloads into "low Earth orbit and beyond," Charania said. 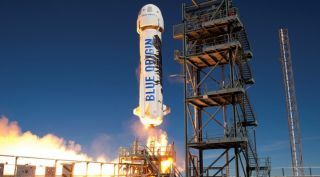 As with New Shepard, the booster of the rocket is designed to be reusable. "We're leveraging the ideas and approaches developed in the New Shepard suborbital vehicle in New Glenn," Charania said. When it comes to having millions of people living and working in space, "You can't get there by throwing the hardware away," he said. New Glenn is still in the planning stage, but several test flights have been planned. The company is shooting for a 2020 debut. "We're opening up the rest of the solar system with New Glenn," Charania said. Among other things, Charania works on upcoming programs at the company. Those include the Blue Moon project, a proposed lunar lander designed for cargo deliveries to Earth's closest neighbor. While Blue Origin isn't directly working on getting humans to the moon, the ability to reliably resupply cargo should help encourage NASA and private companies to put down roots. "We believe it is time for America to return to the moon — this time, to stay," Charania said. Blue Moon, an uncrewed spacecraft, should provide the ability to deliver payloads to the lunar surface, resupplying any lunar colonies that could arise. The vehicle can carry about 10,000 lbs. (4,500 kilograms) to the lunar surface, Charania said. "The moon's relatively close," he said. "That's one of the many reasons we may want to go there." There are numerous scientific reasons to visit the moon, Charania said, adding that the company is interested in possible lunar sample returns. In addition, its proximity makes it a good jumping-off point for sending humans to Mars. Throughout the hour-long session at Dragon Con, Charania lauded the vision of the commercial companies engaged in the current space race, as well as the role of NASA's partnership. He frequently used the adjective "exciting" to describe various aspects of the program. But he wasn't always forthcoming. When asked for more information regarding Blue Origin's rocket designs and testing schedule, for instance, he would often smile and occasionally give a yes-or-no answer rather than elaborating on proprietary information. One audience member asked if Blue Origin had any plans for the 50th anniversary of the first moon landing, in 2019, and it was clear that Charania didn't want to go into too much detail. Instead, he gave a tight-lipped smile and said, "We're actively looking at various architectures and things we could do in the next few years."